The strained relationship between South Africa and their SANZAR partners, Australia and New Zealand, could lead to the dissolution of the partnership according to officials. South African newspaper The Times reports that the executive council of the South African Rugby Union (SARU) has begun exploring alternatives to the partnership, which holds sway over the Super 15 and Tri-Nations, for the end of their next broadcast deal in 2015. The alliance has been brought into the spotlight during this season's Tri-Nations after Springbok coach Peter De Villiers was charged with misconduct for alleging a refereeing conspiracy, a charge deemed to be a 'declaration of war' by SARU chief Oregan Hoskins. "The council gave the instruction that we should look at other possibilities beyond 2015," chairman of the board Dr. Jan Marais said. "We can't do anything about the current agreement because we are locked in until the contract expires. However, there is the strong feeling that we should at least look at possibilities we can explore at the conclusion of our current broadcasting deal. "We won't automatically opt for a renewal of the current deal. I think by then anyway we'll have new people running the game but given the present climate we have at least decided to start looking at options." 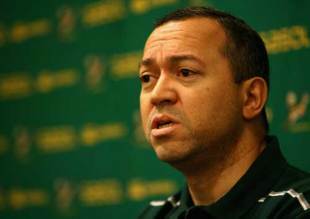 Hoskins was more thoughtful in his assessment of the relationship, saying that strain was part and parcel of the SANZAR landscape and that they were committed to the continuing excellence of the Tri-Nations. "Tri-Nations rugby is a robust game and we have robust conversations in the boardroom and occasionally knock each other down and have to pick each other up, dust ourselves off and get on with it. But it has been like that since day one," he said. "The bottom line is that this is the toughest rugby competition in the world and we're fully part of it with our neighbours. "In that spirit, we'll be having discussions with New Zealand and Australia when they're over here and after that we'll get on with ensuring we continue to produce the best rugby tournaments in the world."